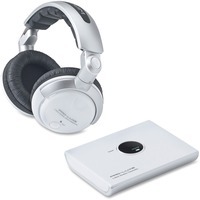 Compucessory Digital Wireless Headphone CCS59226 $80.39 2.4 GHZ Wireless Headphones offer digital FSK transmission and reception, eight channel transmitter. Auto scan headphones have digital volume control and mute feature and built in recharging system. Headphones feature a 40MM driver and 20 20 Khz frequency response. Operation range is 65'. Headphones include two AAA batteries.